Video: Cardiac Conduction System and its Relationship with ECG. Go to video. An electrocardiogram, ECG (EKG), is a test used to measure the rate and regularity of heartbeats, as well as the size and position of the chambers, the presence of any damage to the heart, and the effects of drugs or devices used to regulate the heart. The ECG signal strip is a graphic tracing of the electrical activity of the heart. It measures the length of time it takes for the initial impulse to fire at the Sinus Node and then ends in the contracting of the Ventricles. The first upward pulse of the EKG signal, the P wave, is formed when the atria (the two upper chambers of the heart) contract to pump blood into the ventricles. In A-Fib you will see many “fibrillation” beats instead of one P wave. The next large upward spike segment, the QRS Complex, is formed when the ventricles (the two lower chambers of the heart) are contracting to pump out blood. The next section, the ST segment, measures the end of the contraction of the ventricles to the beginning of the rest period before the ventricles begin to contract for the next beat. 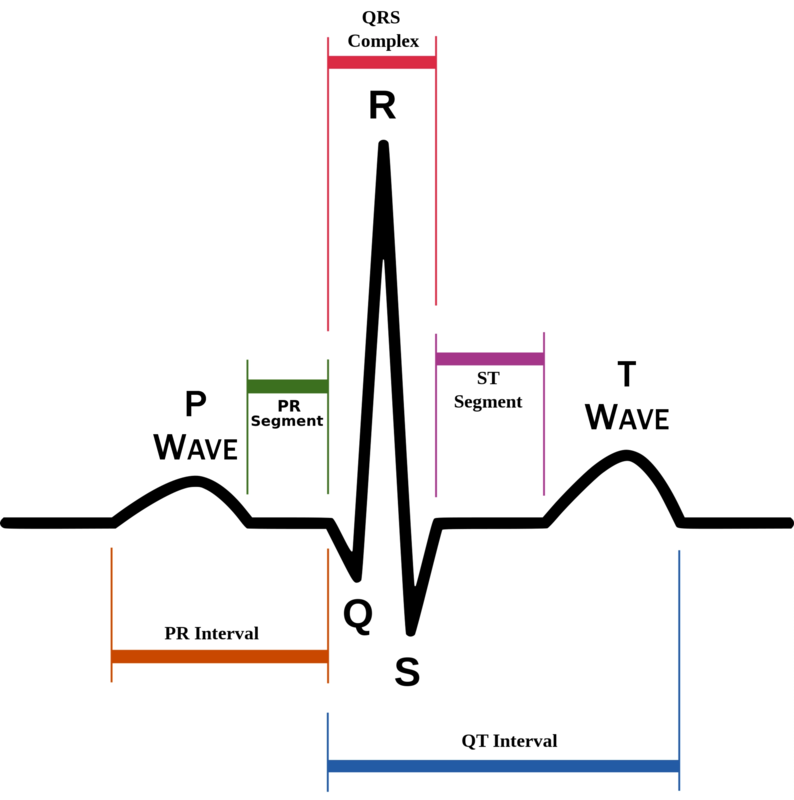 The next slight rising section, the T wave, measures the resting period of the ventricles. In the case of Atrial Fibrillation, the consistent P waves are replaced by fibrillatory waves, which vary in amplitude, shape, and timing (compare the two illustrations below). The output of an ECG recorder is a graph (or sometimes several graphs, representing each of the leads) with time represented on the x-axis and voltage represented on the y-axis. A dedicated ECG machine would usually print onto graph paper which has a background pattern of 1mm squares (often in red or green), with bold divisions every 5 mm in both vertical and horizontal directions. 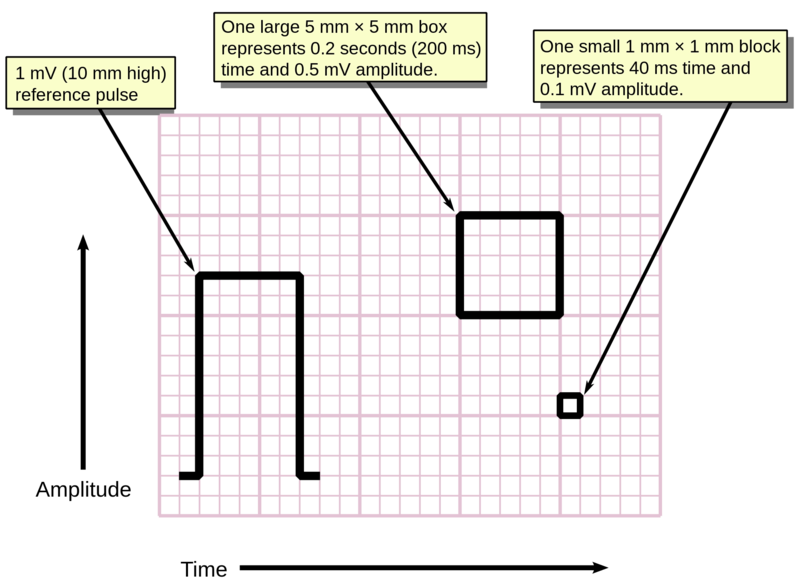 Interpreting a ECG strip involves counting the squares of the tracing. For example, by counting the squares of a heart in Normal Sinus Rhythm, you can calculate the heart rate.